Easy Stitcher is the most space-saving of Hohner’s small stitching machines. It allows quick and easy set-up, handling and stitching, while keeping intact the inherent features Hohner is known for: Strong and stable construction, flexibility and precision – attributes that contribute to Hohner quality in all operations. No matter whether saddle stitching booklets, flat stitching manuals, wire sealing paper or plastic bags in packaging operations, attaching labels and tags or assembling proofs – Easy Stitcher makes it possible and economical. Thanks to the Hohner stitching head HKCN 43/6-S in addition to standard also loop stitching becomes an option (optional). 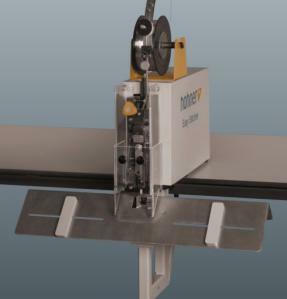 Easy Stitcher – a must for all small print shops and packaging operations where space and budget are considerations. Now Hohner quality is no longer a question of size!